After losing five of their top six point-getters, headlined by PSAC Athlete of the Year Kelsi Lykens, there were questions regarding how potent the West Chester University Field Hockey offense would be this year, coming off a year where they were the PSAC’s highest scoring offense. After a disappointing 1-0 loss to Millersville in the Quarterfinals of the NCAA Division II Tournament last year, West Chester is looking to rebound this season with a strong core group of players returning, with a few new faces ready to step up to the task. The Golden Rams are coming into the season ranked fourth nationally by the Penn Monto/NFHCA Division II Preseason Poll and ranked second in the PSAC preseason coaches’ poll. Junior forward Alayna Brown is the only member of the top six-point-getters for West Chester returning to the team this year. Brown scored 11 goals and posted 14 assists last fall. “I believe our team has a lot of potential this year. Everyone is always working hard. We have solid leadership from our captains and good positivity throughout the entire team,” Brown said when asked about her expectations for the season. A pair of seniors, Kelsey Cheek and Hannah Davies, alongside a pair of juniors, Alexis Versak and Kristina Scherrer, will captain the Golden Rams this season. Junior Alexa Moran is another strong leader for the group, “We have very high expectations for the season. We have a new team with a whole lot of speed and aggression that will help us succeed throughout the season. However, we are taking one game at a time and focusing on what we have to do and not our opponent, we are out there to play West Chester field hockey,” Moran said. 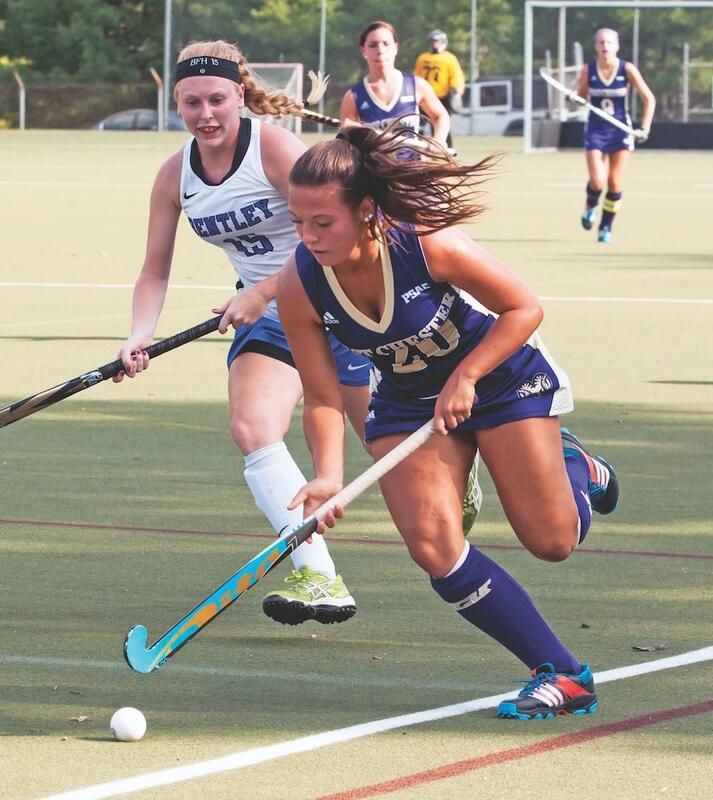 West Chester opened up the season at home on Friday against Bentley University. Sometimes the score of a game can be deceiving as to how close the game was or how one-sided it was. With a 3-1 West Chester victory, that was the story of the game for the Golden Rams on Friday. The West Chester offense proved to be dominant throughout the game, outshooting Bentley 31-6 and holding a 22-2 advantage in penalty corners. Bentley opened up the scoring with about 23 minutes left in the first half off of a lift shot from Taylor Kane that floated over sophomore goalkeeper Audree Bonavita. That would be the lone goal on the day for Bentley, and West Chester responded to that just two minutes later when the highly touted freshman Rachal Toppi netted her first collegiate goal by tipping in a blast from Sherrer off of a penalty corner. Toppi was not done yet, she added to her impressive debut with another goal 10 minutes later with a deflection off of a shot from Dayle Paustian. Paustian had a chance to add to West Chester’s 2-1 lead with 3:05 left in the first half with a penalty shot. Paustian had the Bentley goalkeeper beat, but rang the shot off the goal post and the score remained 2-1 West Chester at the end of the first half. The second half was another impressive showing from the West Chester offense. Davies put an exclamation point on the game with a goal of her own off of a penalty corner with 23 minutes left in the second half to secure the victory for the Golden Rams. Bonavita made three saves in the cage to record the win. “I think we definitely played well together. We have a few things to continue to work on, but getting the win is a great start to our season,” Brown said. If this game is a sign of things to come for West Chester, this season will be an exciting one for the Golden Rams. A dominant offensive performance of 31 shots headlined by the two-goal debut of freshman Toppi, and a strong defensive performance from the midfielders and defenders, will be the key to success this season if they stay consistent. When asked what the key to success will be for the forwards this season, returning, and leading, goal-scorer Brown responded, “Communication and making sure we finish strong on all of our shots.” West Chester looks to continue its early success with a pair of games this week against Lindenwood on Sunday and Mercyhurst University on Saturday.